This is a great post from the Tiger Pens blog about ergonomic pens, for those who have achy hands due to arthritis or just writing too much! The Well Appointed Desk wrote a beautiful post about P.W. 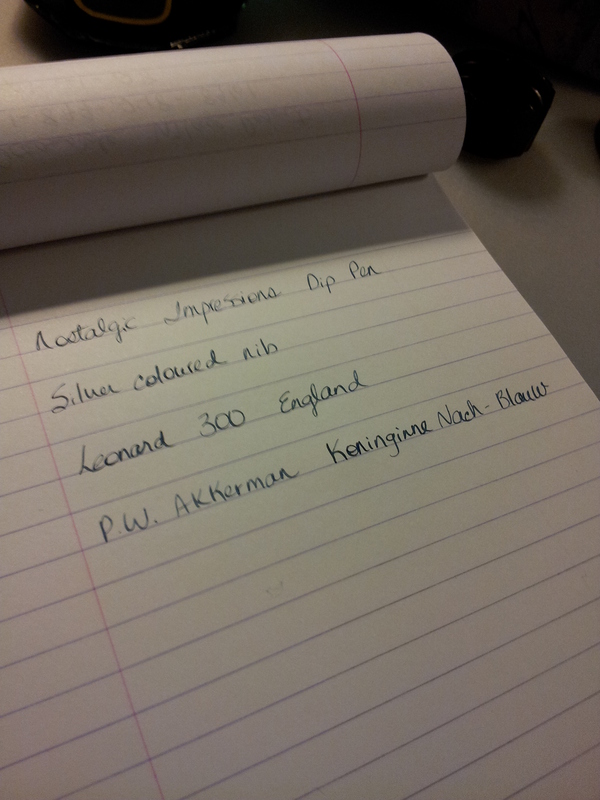 Akkerman’s Voorhout Violet ink. I love the fact that she has so much ink she really needs to make a spreadsheet! I completely understand. 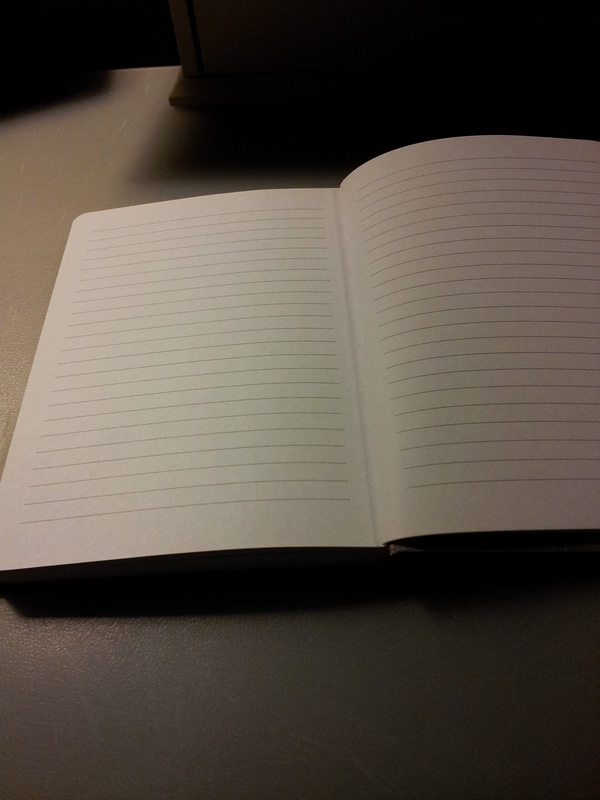 And this notebook review on Pens!Paper!Pencils! of the Roterfaden Taschenbegleiter Organiser – wow, now that’s an organiser! A tad expensive but looks really rugged and well built. Eye candy if nothing else. I spent the day with my lovely sister and she treated me to a birthday brunch. She has truly spoiled me of late (see A Souvenir of Iceland and an Inkwell) and today was a continuation. My life is truly blessed and I am extremely grateful. So in addition to a scrumptious brunch at Lougheed House she gave me an amazing present. First I will show you the beautiful box. 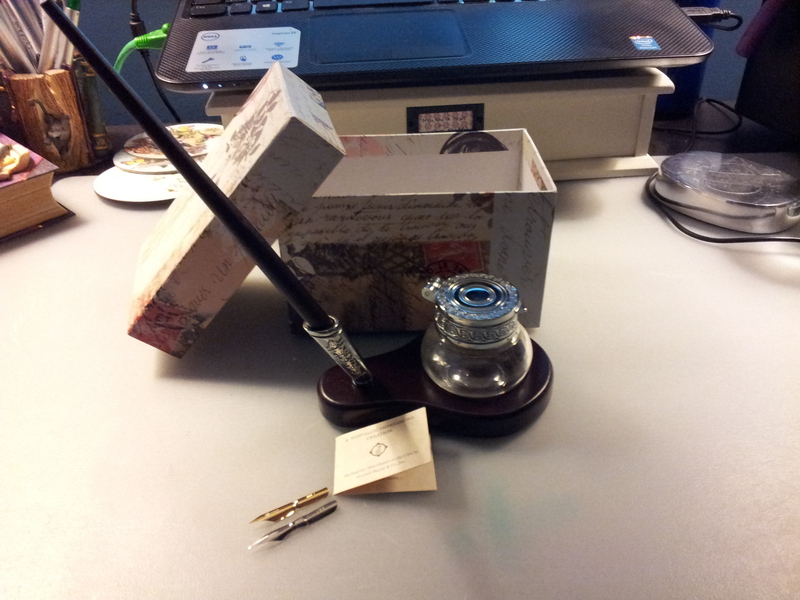 And inside was a beautiful dip pen with stand and glass inkwell. Isn’t it gorgeous?! I am in love. It’s from Nostalgic Impressions (www.nostalgicimpressions.com) and my sister bought it at a Renaissance Fair. Looks like my dip pen collection is growing! 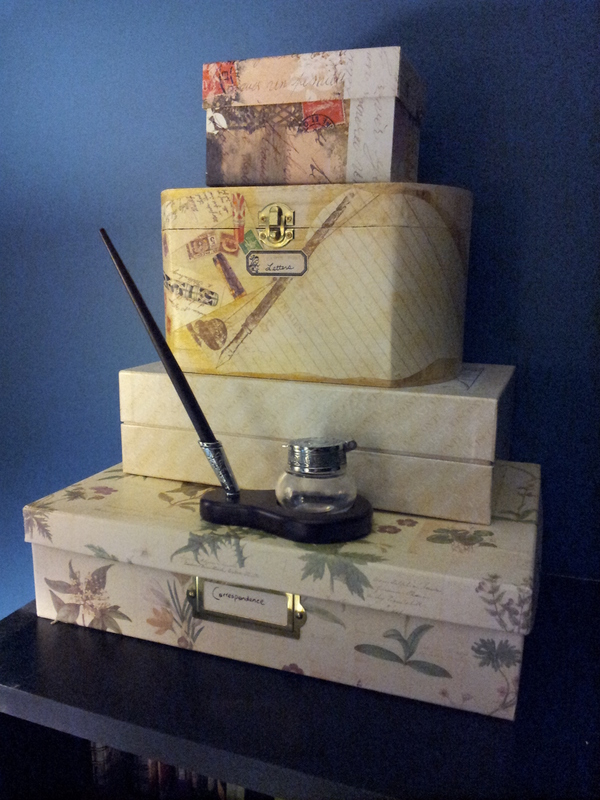 See A Dip Pen From Italy and Wooden Calligraphy Pen. This set comes with two nibs, both of which seem to me to be extra fine. And they appear to be two different metals but not sure what. One is silver-coloured and one is gold-coloured. The silver one says Leonard 300 England and the gold one says Leonard IIIEF England. Here is a closeup of the inkwell and the detail on the base of the stand. 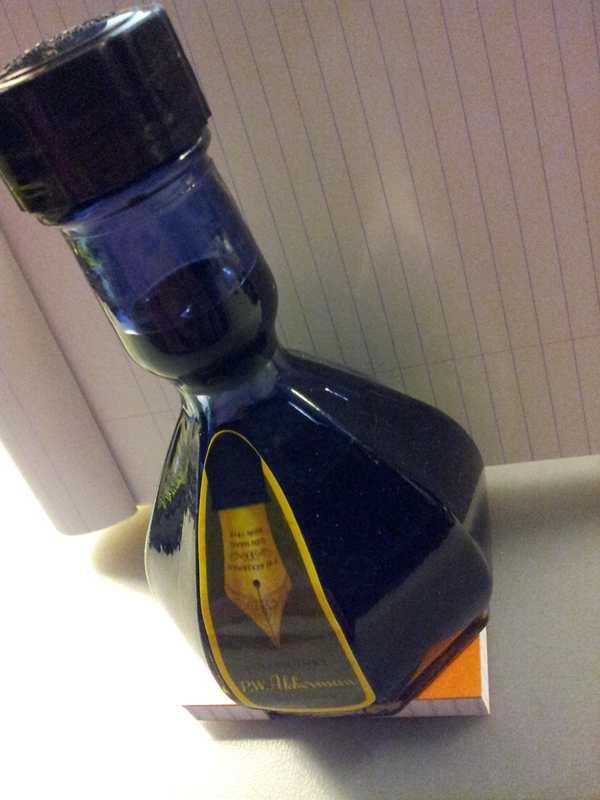 I guess for certain ink bottles this could be a good decanting vessel when the ink level goes below what the pen can access. 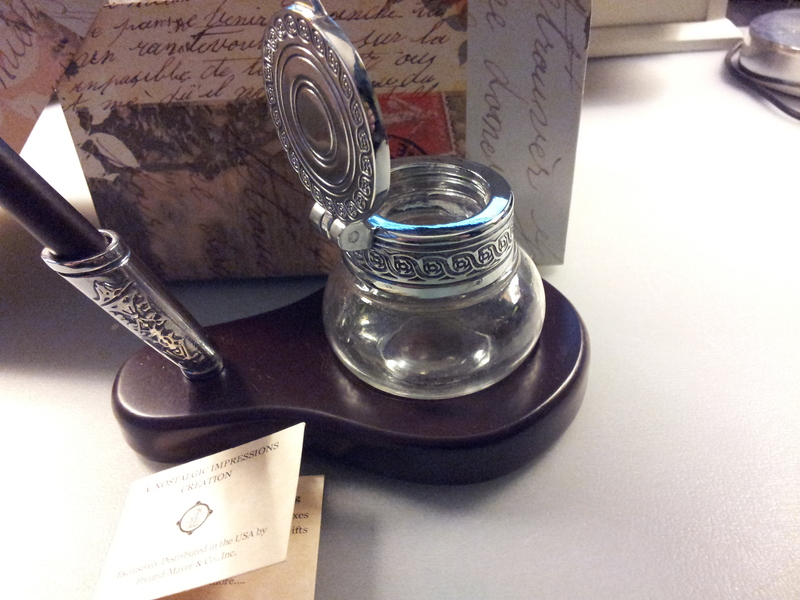 But I use a needle to fill my pens so I doubt I will ever use this inkwell in that way. 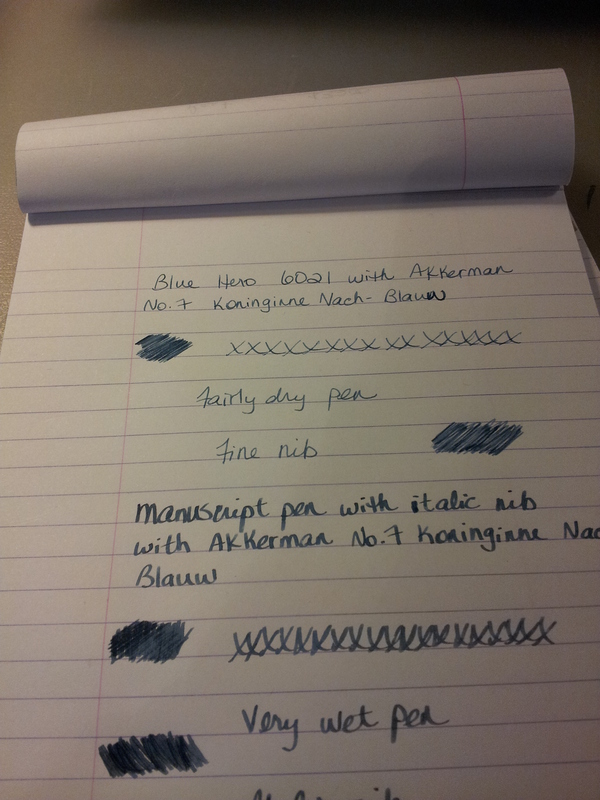 I inked up the silver nib with Akkerman Koninginne Nach-Blauw and did an ink test. It’s extremely scratchy and produced a very fine line. As with the other dip pens I’ve tried I felt like I could snap the nib at any moment. With practice I’m sure I will get used to it. At the end of “Akkerman” I felt the ink was running out so I re-dipped. Then I put the gold nib in and dipped it in De Atramentis Heather Violet. Truthfully I didn’t see that much difference in the results. The gold nib was ever so slightly less scratchy than the silver. Both produced super fine lines. I did not feel I had to re-dip this time. If you are wondering the nibs slide easily into the body of the pen. There is a claw-like mechanism inside that grabs the nib and holds it firmly. 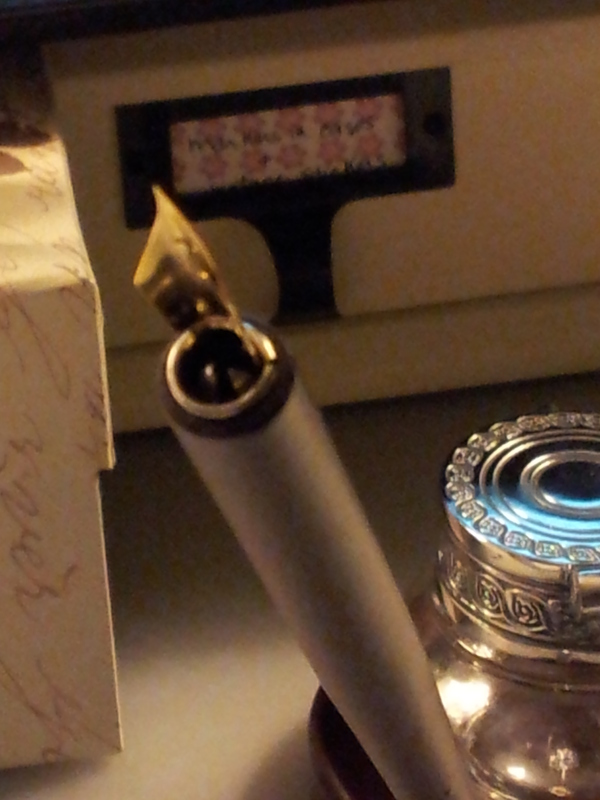 Sorry for the blurriness but I tried to get a closeup of the nib holding mechanism and this was the best of the bunch. I think this will be the home of the ink stand, at least for now. I have the glass inkwell on my desk and I don’t really have the room at the moment. I pile things for a few weeks while I’m working on them and when I can’t stand it any more I clear the desk of all but the essentials. Even with just the essentials I don’t think this ink stand would be showcased like it should be. Not to mention it would be irresistible to the cats, either to knaw on the end of the pen or knock the ink well over. I think it looks striking against the mostly cream background of the tower of boxes so it will live here for the moment. I’m sure the cats could jump up here but I think it would involve too much effort. I’m hoping anyway! Is it just me or is the world becoming a colder and ruder place? I had two encounters with SUPER rude people this week with the ultimate result of making me incredibly sad that such behaviour exists. I won’t go into details but good manners elevate us as human beings so what do you say, let’s try them out? Thank you. 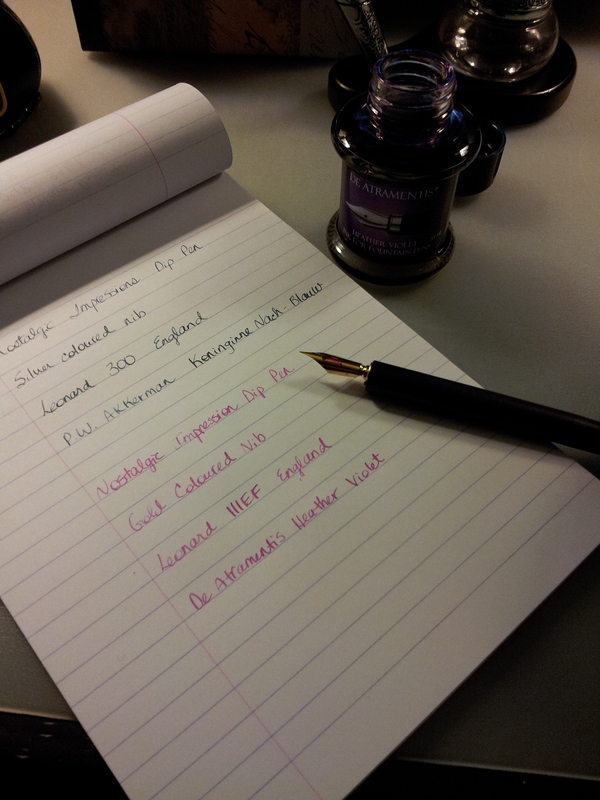 Patiently waiting for word from Wonderpens.ca that my Monteverde Prima in Purple is in! Then I’m going on a little spending spree so I can take advantage of their free shipping on orders over $100. I’ve been doing some research and most of the birds invading my garden these days for the bird seed buffet are House Sparrows. Halley and I love watching them but it seems they are considered a bit of a pest in most areas. Oh well I like them, and Halley loves her bird tv. Remember my Akkerman ink? Back in March I posted about filling my Manuscript Pen with Akkerman ink and how well it performed after that fill. Well I haven’t used that pen in a long time, maybe even since that fill, and this week I unscrewed the cap and wow, there was no hard starting and no skipping. And that pen used to jam on me all the time with the original ink. Just another reason to love Akkerman ink. I can’t remember if I mentioned we had the gift of graffiti presented to us on the back side of our fence. I phoned the City’s graffiti removal program and it took them less than a week to remove it! We couldn’t believe it. Well done City of Calgary. My husband and I were talking about the passions that define us. We agreed that when you wake up in the morning and you can’t wait to do a certain thing, that’s your passion. I read that somewhere and it’s so true. 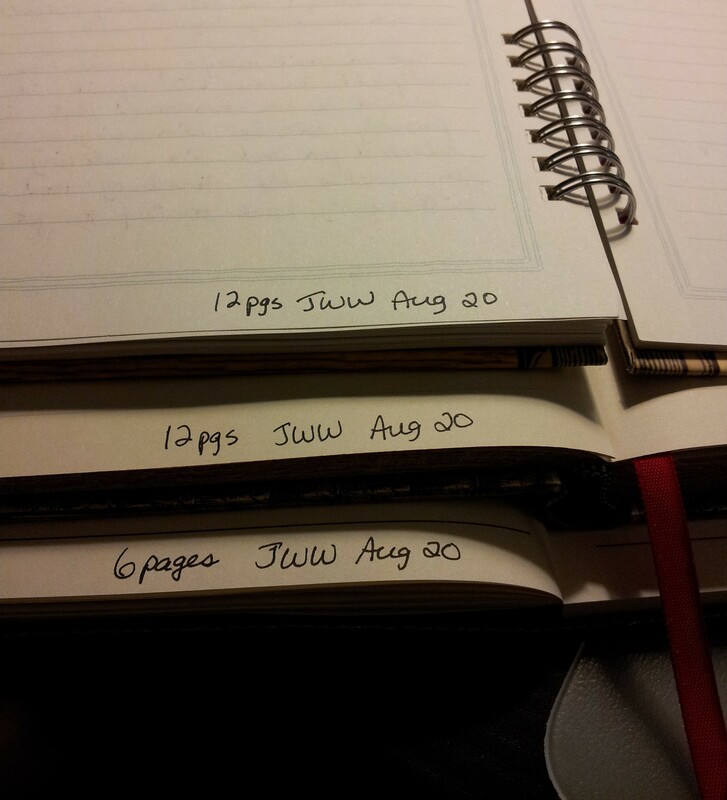 I wake up anxious to get into my journal. He wakes up anxious to get into his studio and make music. If only we didn’t have to go to work! 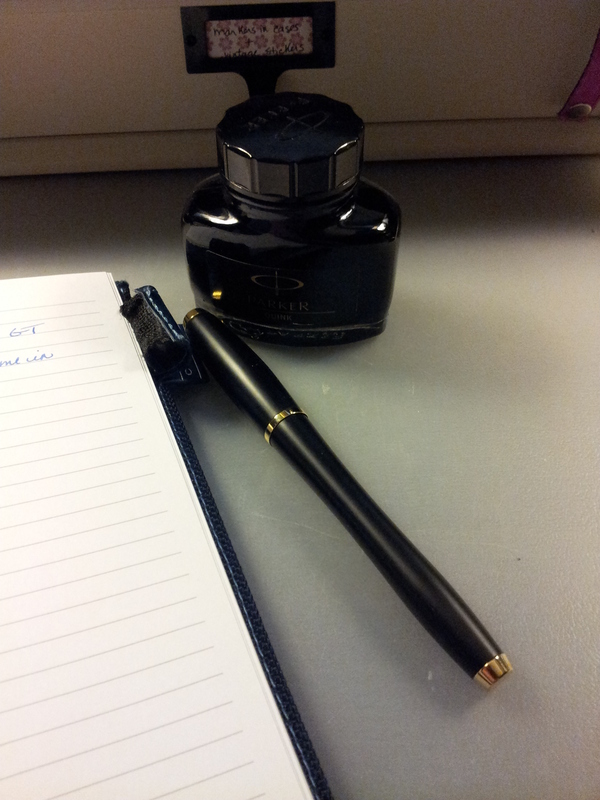 Inked up my black Hero with Parker Quink Blue-Black and made a mess when the converter slipped. Blue-black fingers! Drama resolved at work. The black clouds have lifted! Moved workstations at work. Traded bright morning sun for lazy afternoon sun. Love it. 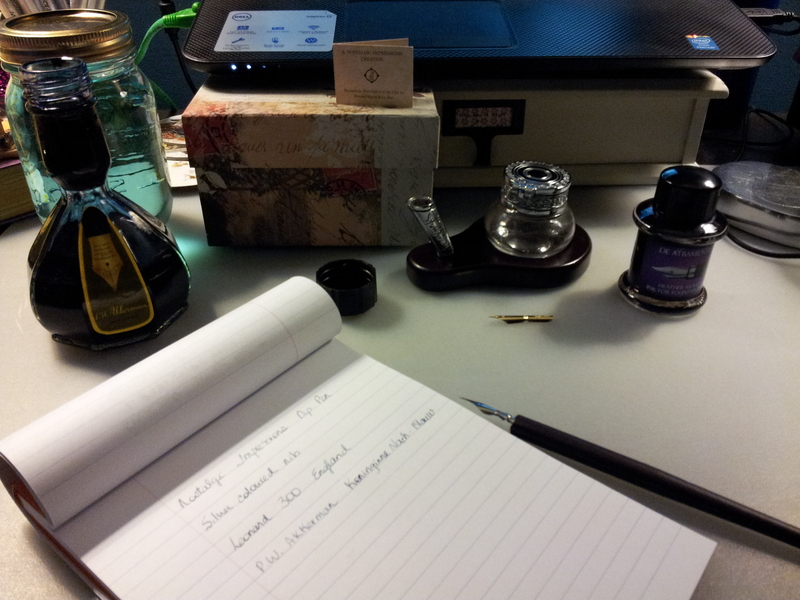 As some of you know I have a small supply of ink, some of which have appeared in blog posts. I have a mixture of bottled ink and cartridges. I can’t say which I prefer – both have their advantages. I was keeping the ink all over the place until I reorganized my office. 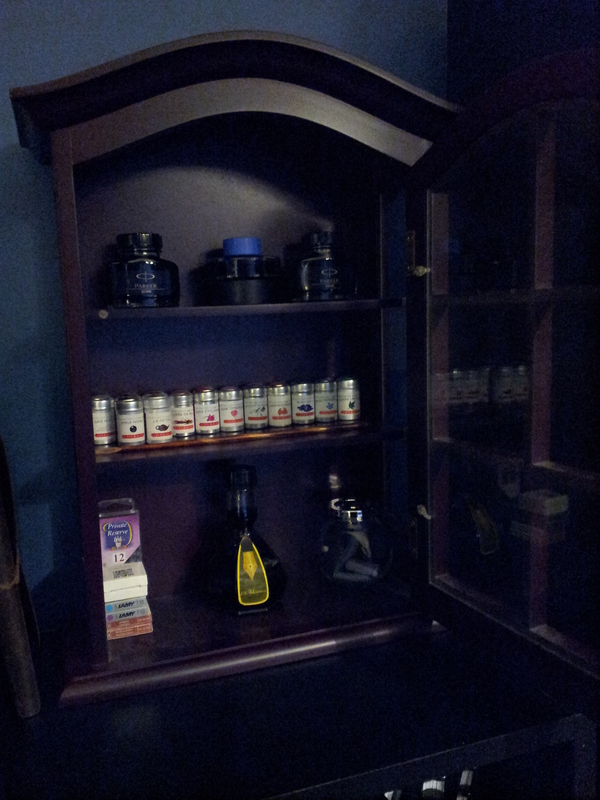 Now I have all my ink in one place: my ink cabinet. 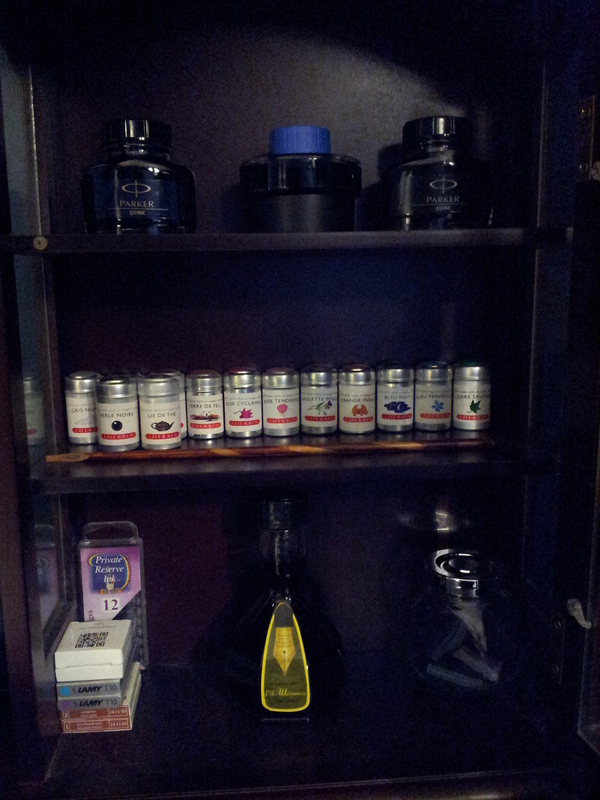 The top shelf houses my Lamy ink in the middle, and my two bottles of Quink. The middle shelf holds my J. Herbin ink cartridge tins, and the bottom shelf has the rest of my cartridges on the left, my Akkerman bottle in the middle and a spice jar full of empty cartridges on the right. I want to buy an ink syringe so I can re-use the empty cartridges. Here’s a bit of a close up. I realize now the dark ink against the dark wood does not make for a great picture but you get the idea. The lighter cartridge packages and tins make for an interesting contrast I hope. The cabinet was a Christmas gift from my sister many, many years ago. I think it originally contained bath products or something like that. I kept the cabinet because I thought it was beautiful. It’s been keeping some figurines safe for me but I recently bought a curio shelf at an antique store and it is perfect them. That left this cabinet open for possibility, and I thought my ink would look nice in it, while still being kept out of direct sunlight. 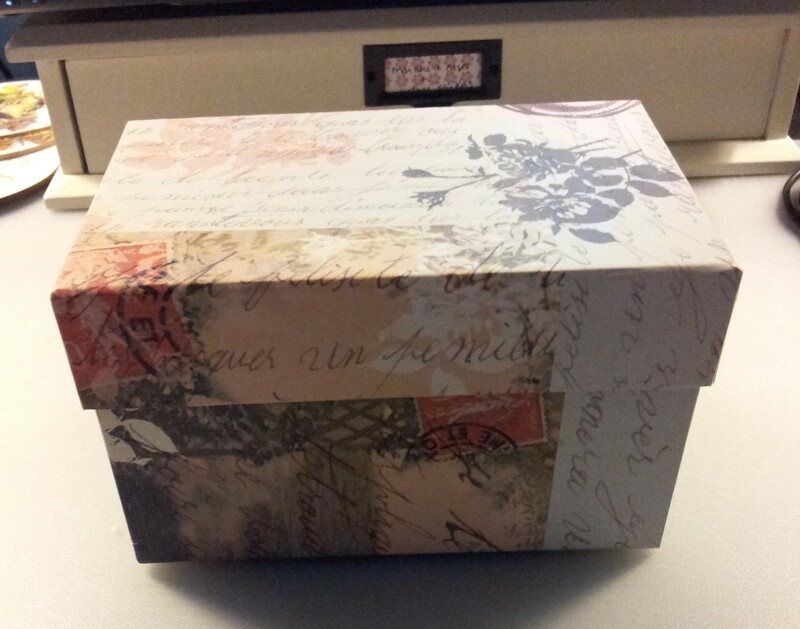 Having fun with Postcrossing.com. I’ve received two postcards! Took a long walk last Wednesday night, had to record sights and sounds of spring! My parking tag was stolen at work; I got a parking ticket and then it was reversed. Yay! And then I got a new parking tag. Yay! And that’s about it. Off to write in my journal. I wanted to share with you the last of my Christmas journals. 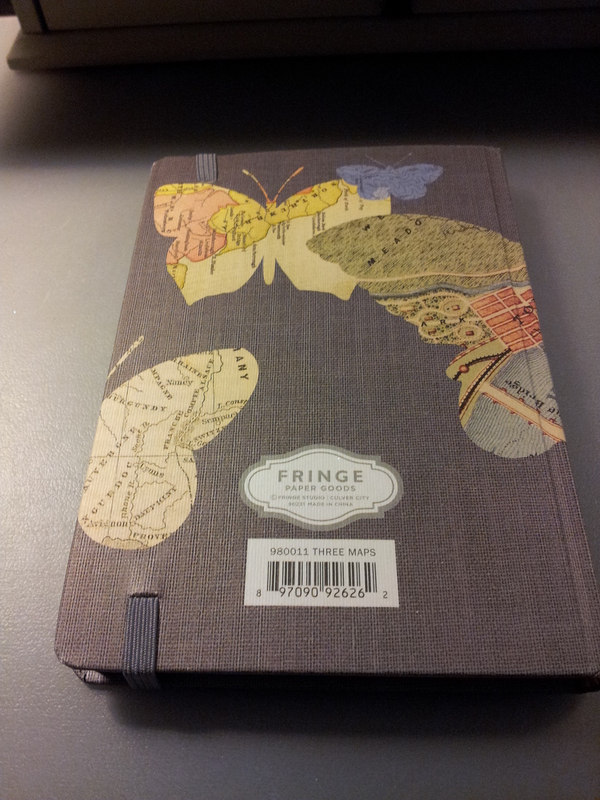 A good friend gave me this Butterfly Journal from Fringe Paper Goods. 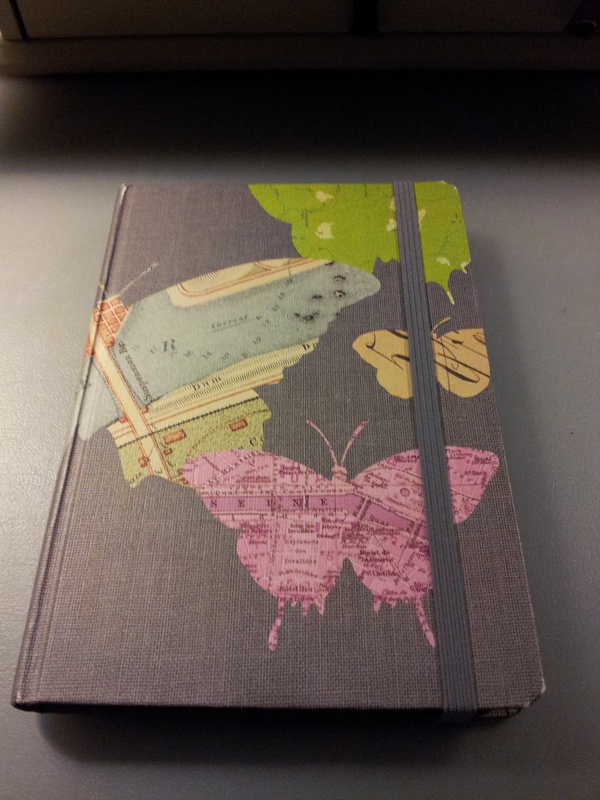 I call it the Butterfly Journal but I think it’s actually called Three Maps (that’s what is on the barcode on the back). 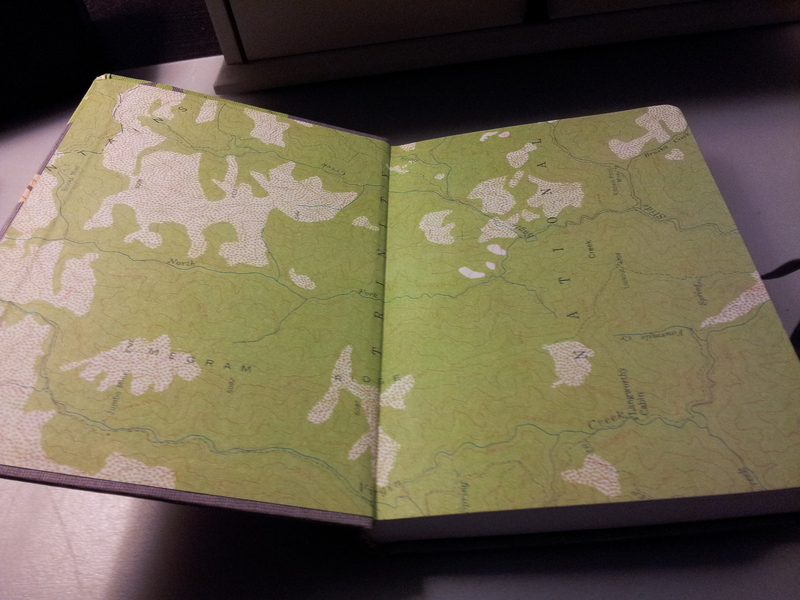 And you can see why – inside each of the butterflies and inside the actual journal are beautiful maps. I think it’s a US map; I see Trinity and National and various names of creeks and ridges. I could Google the names I suppose. 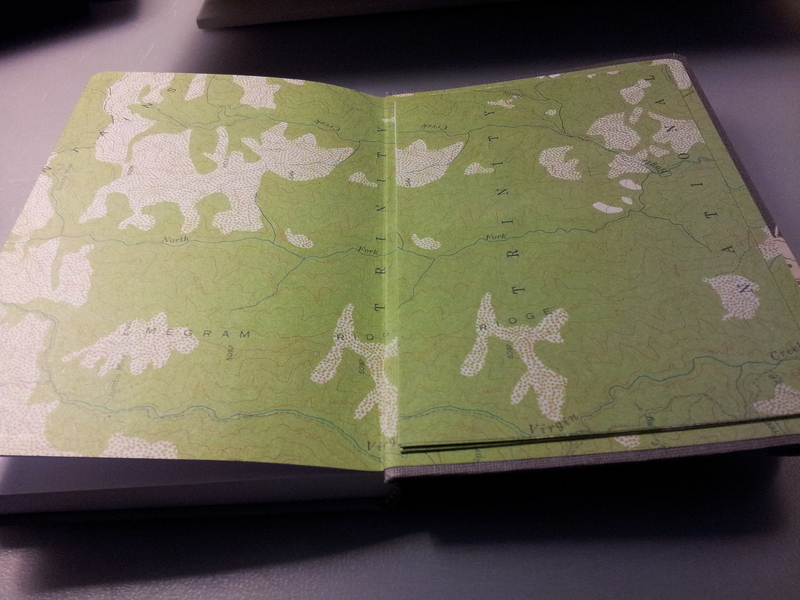 And the same map is on the back cover, with a pocket. The paper feels great; not sure what the weight is. I will do an ink test when I’m moving into the notebook. The back cover. Really beautiful notebook! Sorry to jump around, but I also wanted to get into my Akkerman ink, which I mentioned here. Lots of folks have been asking if I’ve inked up any pens with it yet, and yesterday I did, and here are the pictures! So I wanted to put the Akkerman blue ink into my blue Hero 6021. Before I could do that I had to empty the blue Hero and clean it. This was my first time and I followed the instructions from Goulet Pens. Above is the Hero in distilled water. I moved the plunger up and down until the water within the pen was clear. I also emptied my Manuscript pen. I wanted to ink them both up with the Akkerman ink because they have very different nibs. Aren’t the ink swirls beautiful? 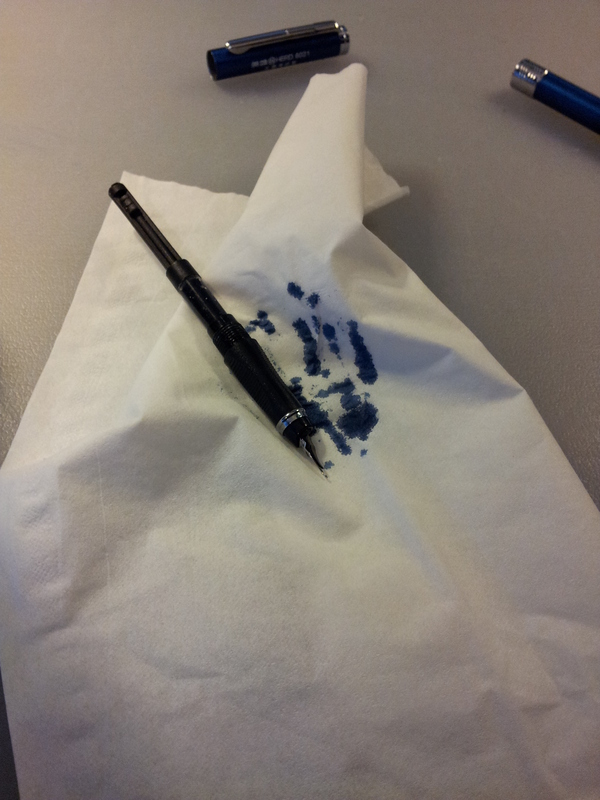 Once the water within the pen is clear you wipe off the pen with a tissue or paper towel. There could still be some ink in the feed but that’s ok. 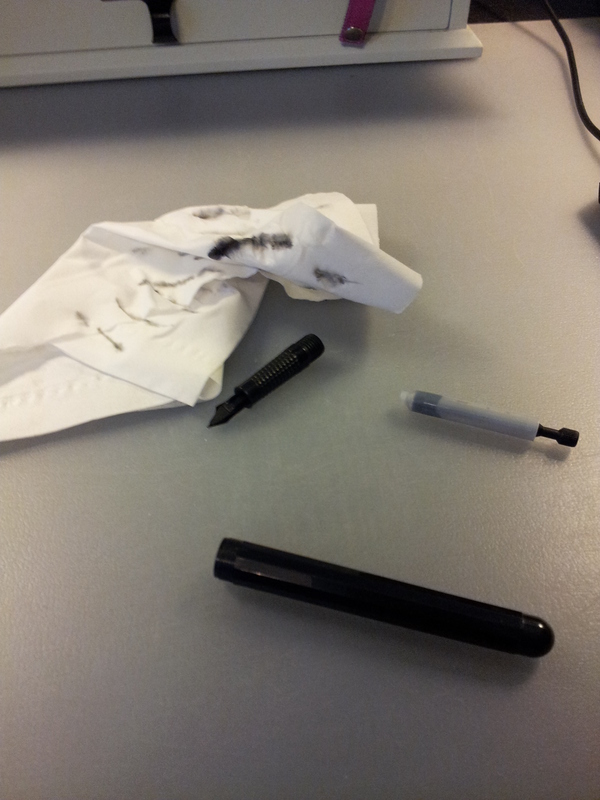 Above is my Manuscript pen disassembled and drying. I did the same with the Hero. 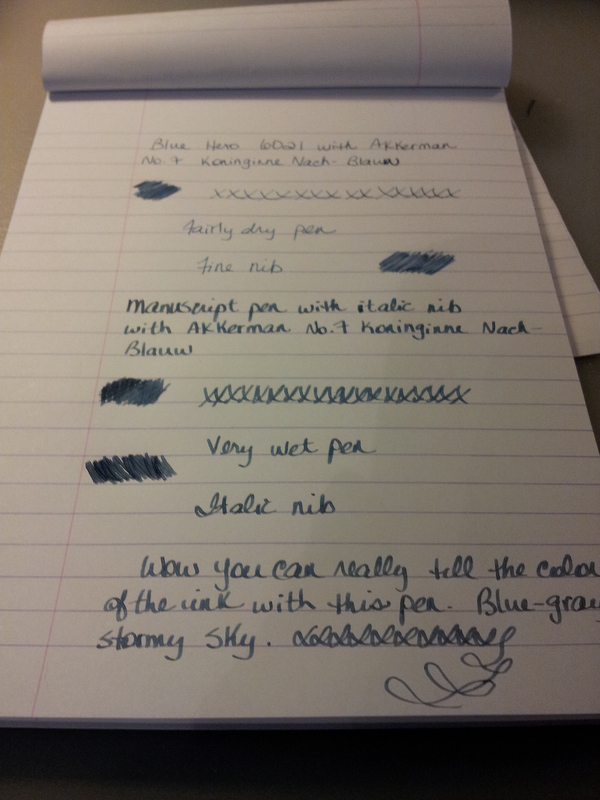 So then the next step was to fill the pens with the Akkerman ink. I turned the Akkerman bottle over to fill the reservoir. Above is a picture of the bottle with the cap removed. You can see there is a good amount of ink in there. It’s almost to the top of the rim of the bottle. Then I plunged the pen into the top of the bottle until I hit the marble. I drew the plunger up and the ink flowed into it. I wiped the pens off and put them back together again. 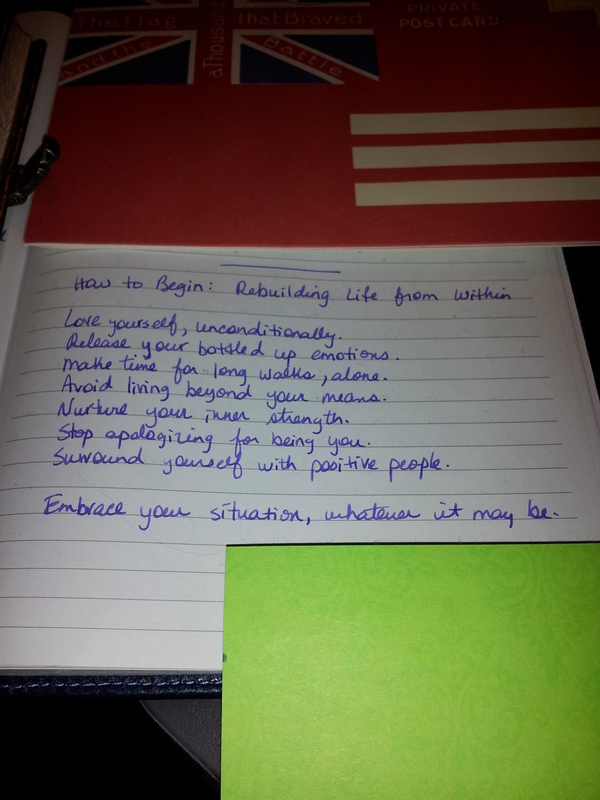 And then I started writing in my Rhodia notebook. The Hero 6021 is very fine and on the dry side. The Manuscript pen has an italic nib and is much more wet. 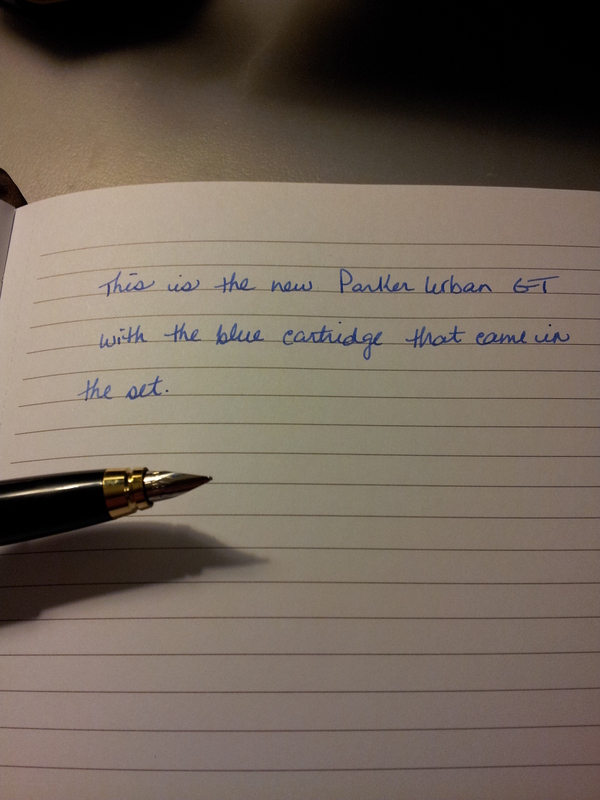 You can really see the ink colour with the Manuscript pen. Stormy sky indeed! And I’m thrilled with how the Manuscript pen is performing, now that it’s been cleaned and I have moved to the converter as opposed to the cartridge. It used to be a super slow starter but over the last two days I have had no trouble with it whatsoever. 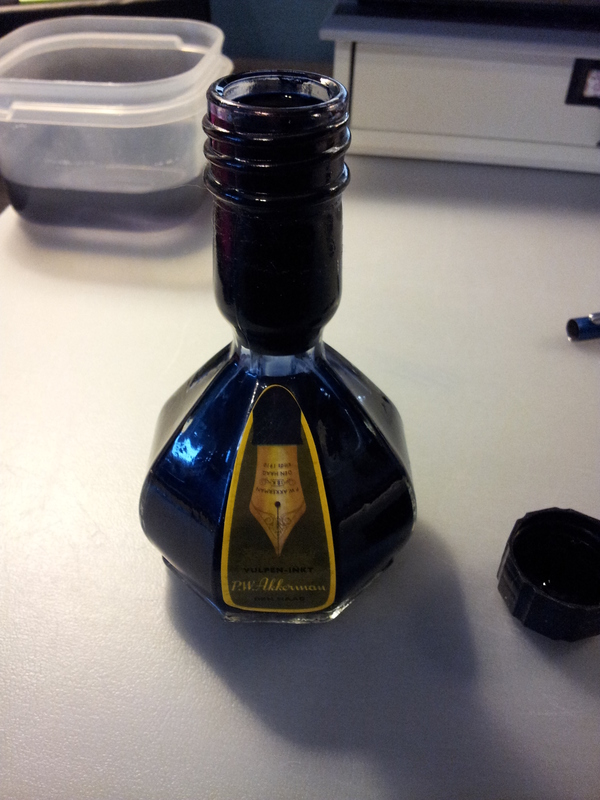 Could be the cleaning, could be the ink (although previously the ink was J. Herbin Perle Noire and I’ve never had problems with it), or could be the change to the converter. Whatever the reason it’s a different pen. And I LOVE the ink colour! 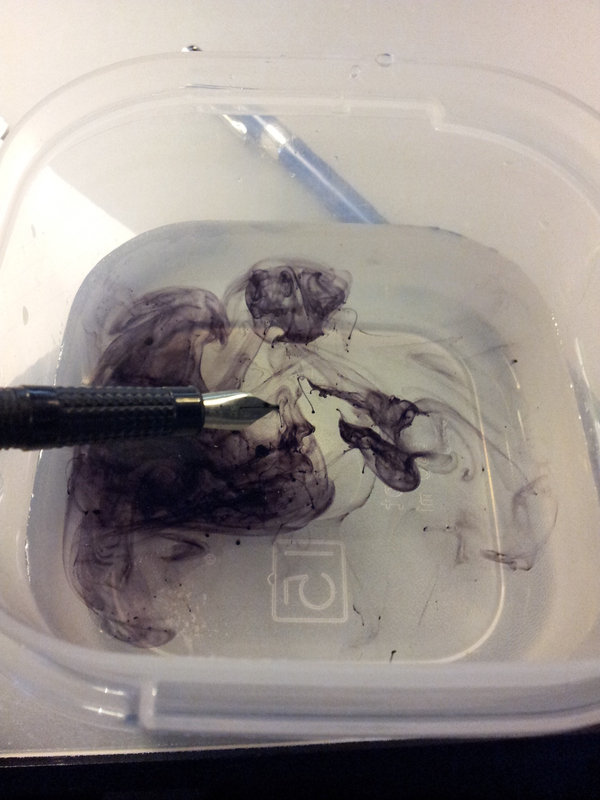 I have used two cartridges, filled another pen with the black quink, and of course used the pen. 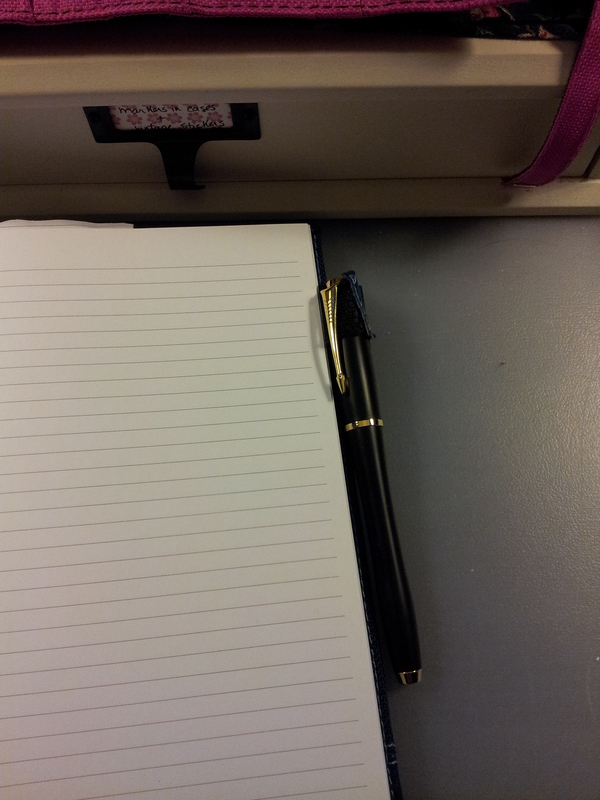 I have not read How to Write with a Fountain Pen but I will – who knows, I might be doing it wrong! 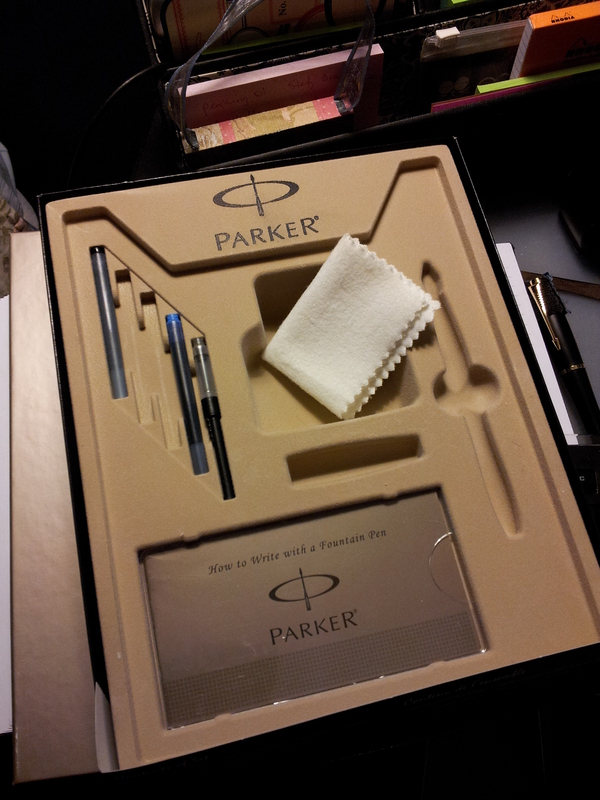 This is the Parker Urban in the pen holder of my Cross journal. Have I mentioned how much I love this pen? It is definitely my number two fave, after the Monteverde Prima of course. A writing sample and a closeup of the nib. It’s total darkness in that bottle; it’s a beautiful black. I like the blue too; I just may have to buy a bottle of that too. Speaking of bottles of ink!! My Akkerman bottle arrived in a big cardboard box filled with styrofoam popcorn and two different types of bubble wrap. I was already impressed but then I opened the inner Akkerman box and it too was filled with more styrofoam popcorn. 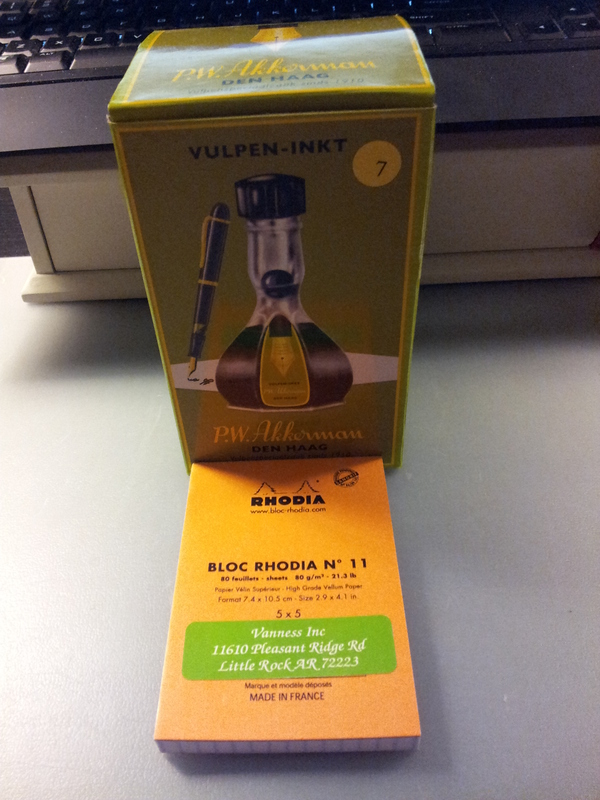 The bottle was wrapped in a bag and a small Rhodia notebook was wedged firmly between the bottle and the sides of the box. 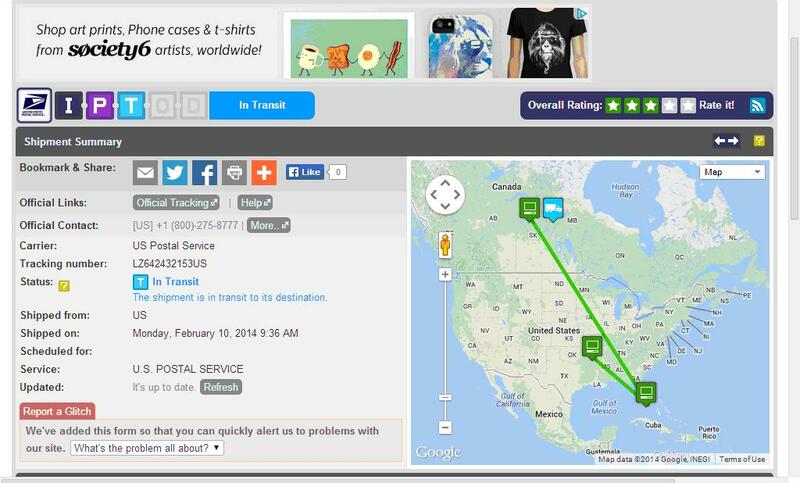 I don’t think that bottle moved a centimetre during it’s long journey from Arkansas to Miami to Calgary. Excellent packaging; thank you Vanness! 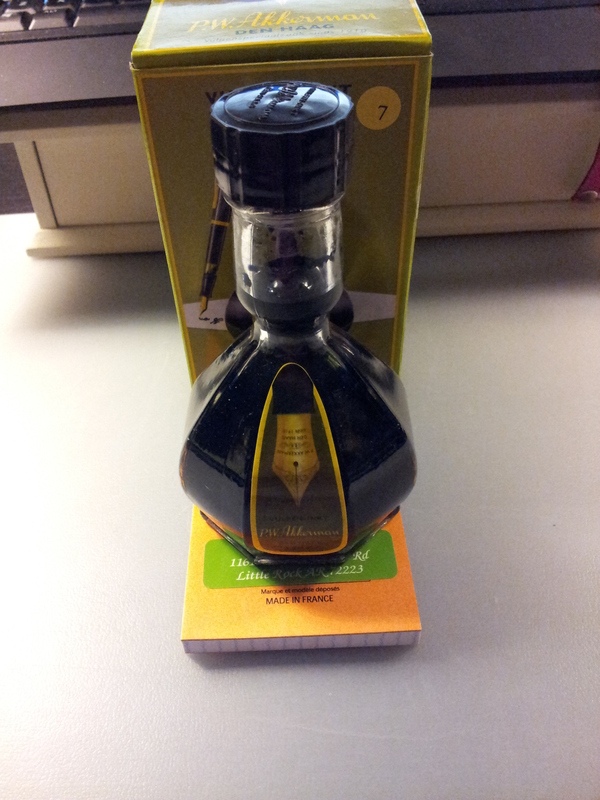 I was afraid the ink would freeze and the bottle would break. But it arrived in perfect condition and I am absolutely thrilled with it. This is the 150 ml bottle, which Akkerman is discontinuing; they will offer the 60 ml bottle instead which is just a smaller version of the iconic bottle. What makes the bottle unique is the neck design. There is a marble inside the glass that sits at the base of the neck. Tip the bottle over and the neck fills with ink. Dip your pen into the reservoir to fill. 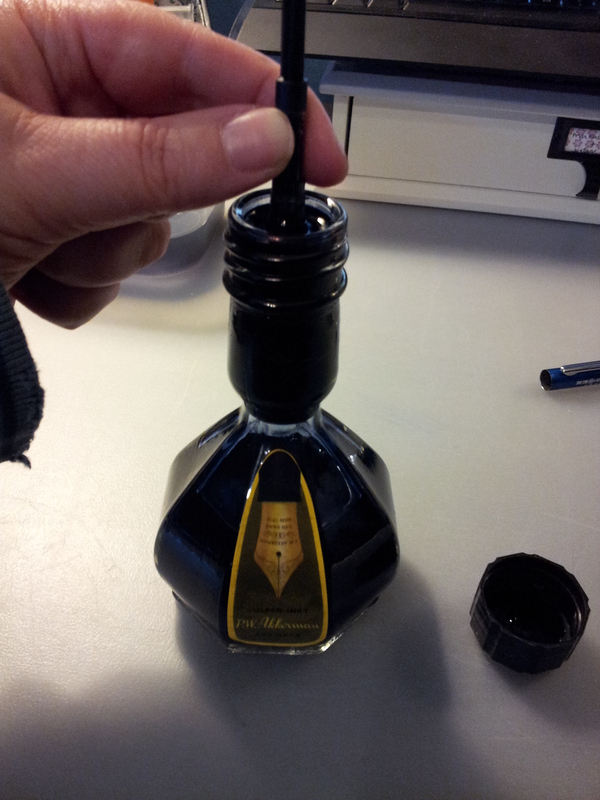 Then you can tip the bottle to the side and all the ink drains back into the bottom. Genius! 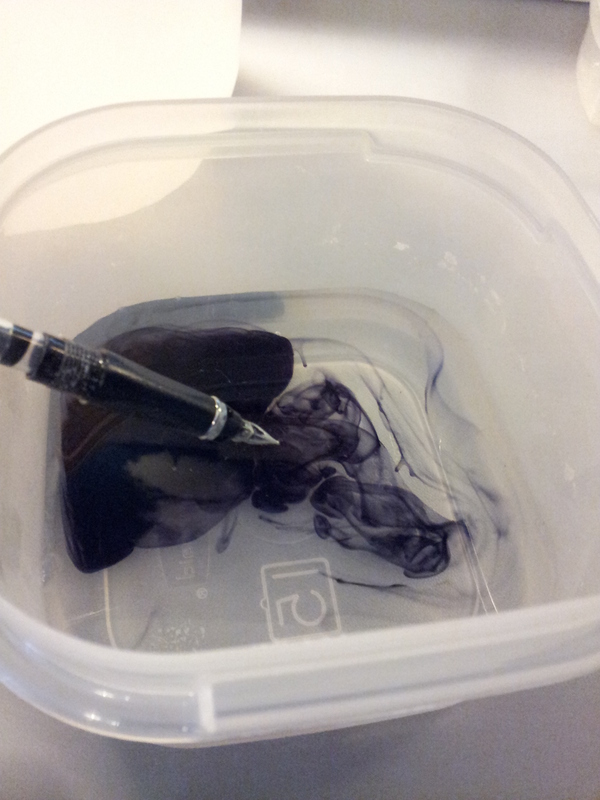 I tried to take a picture to show you a) the marble and b) the colour of the ink, which is called Koninginne Nach-Blauw. It’s super hard to see the marble but trust me it’s there. And the ink has stuck to the sides of the neck so you can sort of see the colour. I haven’t inked any pens with it yet, as I’m in the process of cleaning them. There will be a future blog post about it, for sure. The P.W. Akkerman website has a colour chart, and No. 7 looks like a stormy sky to me. Can’t wait to ink up a pen with it. Until next week, happy writing. This quote was posted by a friend on facebook and I had to write it in my journal. Beautiful. 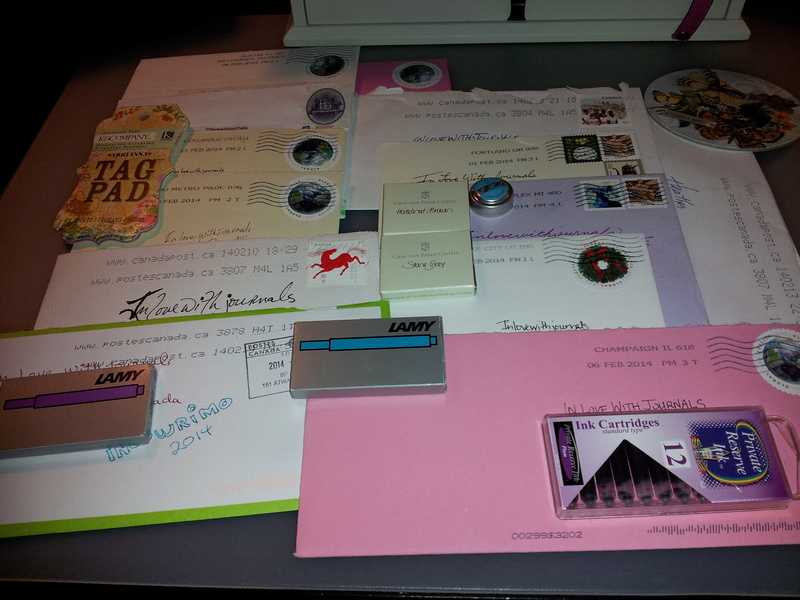 Most of my InCoWriMo letters received to date. Got some more today.